Is Mt. Vernon Flossing out of Fear? 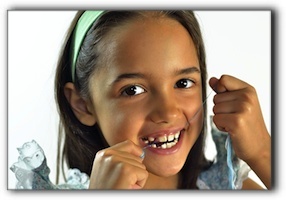 Most Alexandria men and women know that flossing is an important part of oral health. The value of this simple yet important exercise in oral hygiene has been shown time and time again. But does fear have to play a role in Mt. Vernon’s commitment to the practice? Flossing offers a chance to remove bits and pieces that a toothbrush will undoubtedly miss. But, being afraid of the ‘cavity bugs,’ ‘mouth germies,’ or the ‘dental bogeyman’ may still not compel Alexandria folks to floss regularly. The fear of gingivitis and gum disease or crowns and fillings from cavities work for a week or so after a cleaning, but may not instill a lasting habit between teeth cleanings. At Mt. Vernon Center for Dentistry in Alexandria, we encourage our dental patients to look at flossing as an opportunity to start fresh just as showering and dressing for the day is a positive way to increase motivation and initiate flossing into your established routine. Flossing can be a positive opportunity to remind yourself to smile and feel happy as you approach your day. Flossing could be a time to think about the foods you are putting into your mouth and consider what improvements could be made to your diet. Living in health-conscious communities such as Alexandria, Mt. Vernon, or Alexandria can also help motivate you to floss regularly. The fresh air you breathe on a short walk will feel smooth as your run your tongue along the ridges of your teeth near the gums. It doesn’t have to be about fear! Call us at 703-360-5881. The skilled dental staff at Mt. Vernon Center for Dentistry knows that flossing can be a concern for their Alexandria dental patients and a brightened patient is always better than a frightened one. At Mt. Vernon Center for Dentistry, we offer many ways to enhance your smile and self-confidence. Make a cosmetic dental appointment today to consider whether teeth whitening can lighten your look, dental implants can influence your flair, and sedation dentistry or dental crowns can ease your anxiety. We aim to make it an exceptional experience! Not Happy With Your Alexandria Dentist?